YubiKey is a fantastic, easy to use two factor authentication device that combines hardware-based authentication and public key cryptography. When using YubiKey you simply insert it into a USB slot and then authenticate with a touch. There is no need for texts to be sent to you with codes or for authenticator apps. As authentication is allowed by touch YubiKey is four times faster than typing a One Time Passcode. YubiKey has some great features that make it an authentication device that you can’t live without. It does not require a battery or network connectivity so it is always on and accessible. It also reduces IT operational costs and is crush resistant and waterproof. YubiKeys are also built on state-of-the-art secure elements, moulded into plastic with high pressure, making them tamper-proof. 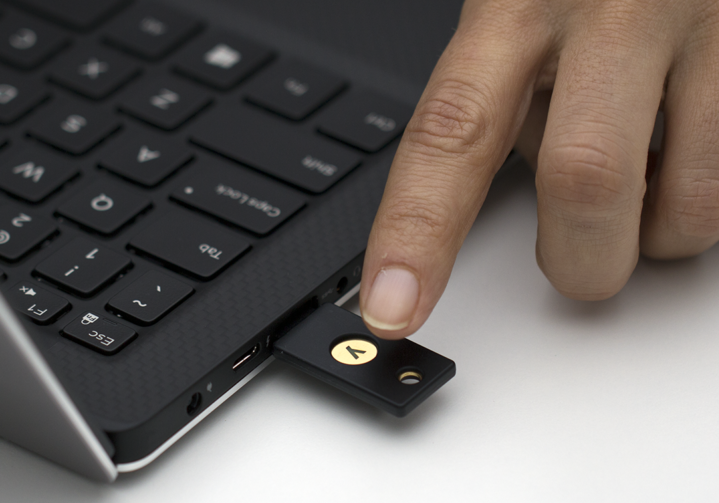 YubiKey is brilliant because it protects access to computers, networks and online services. It is designed to work off-the-shelf and works with hundreds of services including Windows and Mac login, Gmail, Dropbox, Facebook and LastPass. YubiKey is perfect for those who want to protect their devices from account takeovers. You can choose from four different YubiKey models depending on your needs. The keychain model is designed to go anywhere on a keychain. The Nano model is small enough to stay in the USB port of your computer and you can also choose between USB-A or USB-C.